Flat, fast and in cool temperatures. That is how you might characterize the three marathons that I have run. Two were in Chicago, whose October temperatures can vary wildly but are usually cool, and the third was in Traverse City, Michigan. You could say I cherry picked those and you’d be right. As recently as this year I thought, if I’m going to put the many hours and miles of training into a marathon, I want to at least enjoy the event and not suffer in awful conditions. I had learned to deal with heat in half marathons, but the idea of slogging through a full did not call to me. I guess it’s because I’m a very sweaty guy. In fact, I’m the third sweatiest person I know. I start perspiring by standing still in 70’s temperatures. It must be genetic because I don’t have any other explanation. I’m not high-strung, don’t have a high body fat percentage and certainly don’t want to be sweating. But it still happens. I come back from short, 4-mile runs looking like I jumped in a lake. All that water loss leads to a depletion of energy, especially in humid conditions. In these cases, the sweating process is thrown out of sync because the water in the air doesn’t allow perspiration to evaporate, which is what cools us. 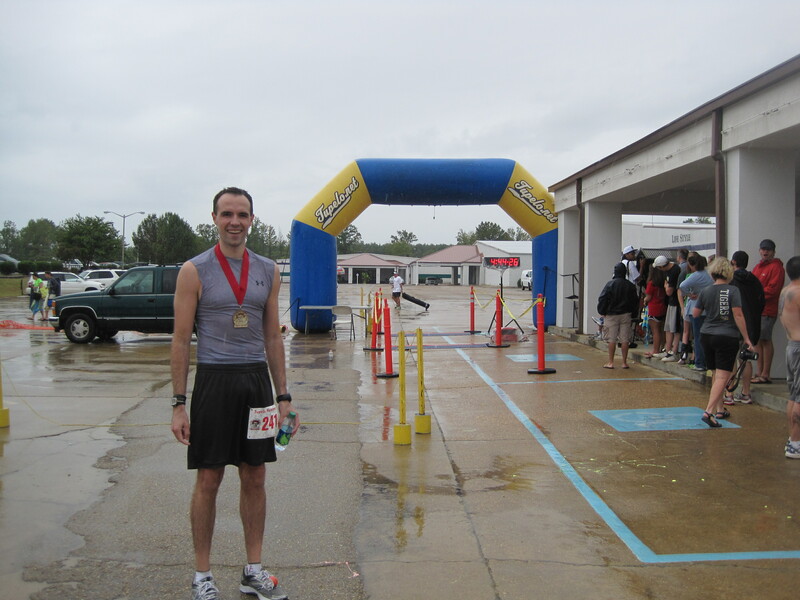 So in hot and humid races (such as the 2010 ING Miami Half Marathon and the 2011 XTERRA Trail Race in Columbia, South Carolina) I end up quickly bereft of all energy and overheated. So it should go without saying that I would avoid any races held in typically hot, humid areas. I would probably stay away from most summer races altogether unless they were in Canada or the Pacific Northwest. Summer would be for me what winter is for most runners – that time of year where you just relax and let yourself go because it’s too awful outside to hit the pavement. You’d think that. But I ran a very humid race in Connecticut and followed that with the single most arduous race experience ever in South Carolina … in July. So I suppose it was only natural (or crazy) to continue this defiant trend and go for a full marathon in a similar environment. And why not? It’s an almost adolescent reflex: if someone tells you you can’t do something, it just makes you want to do it more. In this case, that someone was my body. I wish I could say that it was this personal, passionate drive to push myself to my limits and prove that things as elementary as “temperature” and “dew point” couldn’t keep me from running a marathon; that the sport is more of a mental game and that no physical shackles could hold me back. 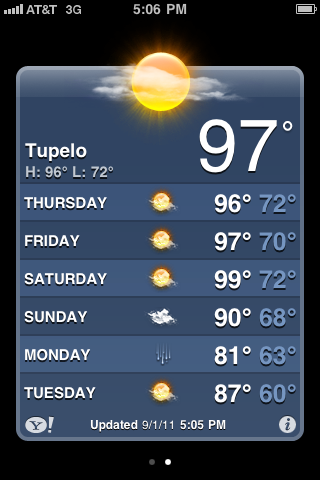 But that’s not the real reason I signed up for the Tupelo Marathon. We’ll get to that later. I actually signed up for the race before my races in Connecticut and South Carolina. Things might have been different if I had waited until after crossing those finish lines, heaving and deliriously looking for a water bottle. But in this universe, I committed hastily and a few months later, landed in Memphis, ready to make the 90-minute drive down to Elvis Presley’s birthplace. I arrived around 10:30 AM and my room wasn’t ready so I drove out to Trails & Treads, a local multisport store, and picked up my packet. While there I met the race’s director, David Whiteside, who recommended that I go out and drive the course. 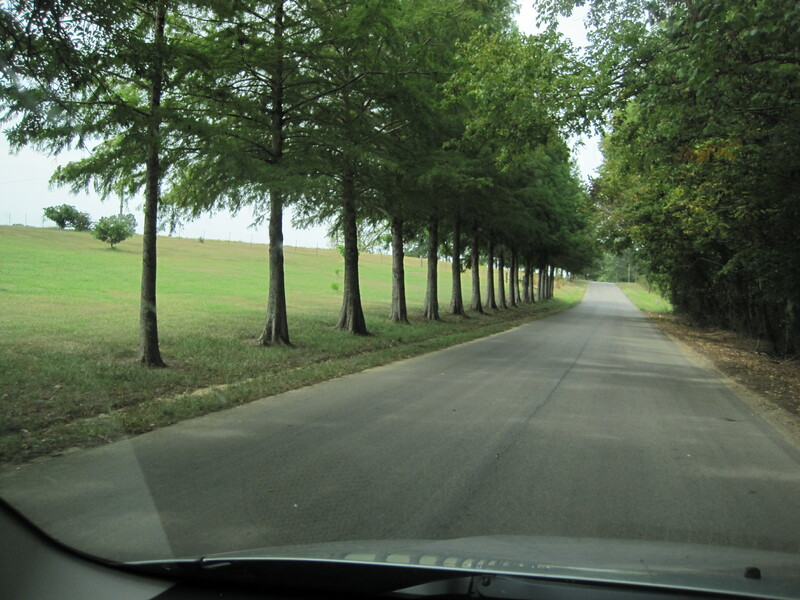 I obliged and took a nice stroll through the first 9 miles of the course’s winding roads, flanked by farmlands, large estates and forests. That night I went to Vanelli’s, an Italian restaurant next to my hotel, and threw down some last-minute angel hair pasta. It was 4:45 PM by the time I finished eating. The early wake-up had thrown off my eating schedule. Breakfast had been at 4:30 in the morning and lunch around 9:30. Since the race was starting at 5 AM (you read that right, five in the morning), I was planning on going to sleep early, which also meant an early dinner. I was anticipating a sleepless night, but the sandman was merciful and I managed to log five hours before my alarm went off at 2:45 AM. There are two reasons for the race’s absurdly early start time. The first is that the roads aren’t closed for the event, so the sparse early morning traffic goes some way towards keeping runners safe. The second, more important reason, is that Tupelo is consistently hot and humid so the race is held extra early to avoid dangerous conditions. I had trained all summer in anticipation of these conditions. Runs that I would normally schedule for the early morning were moved closer to noon to get more heat exposure and days where Chicago hit 90, I’d go for a run in hopes of getting acclimated to the scorch. Whiteside tried to reassure me by talking about last year’s bizarre temperatures, which were in the 50’s at the start. But this year’s forecast was providing no such comfort, so I went in expecting the worst. Sunday looked like a buffer between a long streak of oppressive heat and the advent of Hurricane Lee. Saturday logged a hi of 97, yet from Monday onward, days were all in the low 70’s and rainy. Sunday had a very narrow temperature range: an overnight lo of 74 and a daytime hi of 83 (not awful, but far from ideal). This was made a little less attractive by Lee’s surge of tropical moisture entering Louisiana and Mississippi. As we walked to the start line on Chesterville Road, I wasn’t uncomfortable or even hot, but I could feel the humidity in the air. The race started right on time, sending about 450 runners on their way to finishing either the marathon or the shorter 14.2-miler. With only 225 running the full 26.2 miles, it was easily the smallest marathon field I have ever run with. Despite this, there were many runners from all over the country. The race has developed a cult following in the running world, attracting many 50-staters, Marathon Maniacs and Half Fanatics looking to add Mississippi to their list. Guilty. It’s a very bare-bones organization, which is fitting for its size. There are no MC’s, no pre-recorded national anthem, no corrals or gear check – just a bunch of people itching to run. The first six miles of the course are run on Chesterville Road and in pitch darkness. Whatever patch of road not lit up by sparse streetlights was occasionally revealed by headlamps or handheld flashlights. I tried to stay behind runners with lights because they helped me see the mile markers, which were spraypainted on the pavement. I’m glad the road was evenly paved because some sections were so dark that I wouldn’t have been able to see a pothole. With little to focus on because of darkness, I started paying close attention to the weather. I was definitely sweating by the first mile, but not profusely. I would later find out that it was 80 degrees with 54% humidity. There was a light breeze cutting across the course, keeping my spirits higher than I would have expected. But that’s the problem with long-distance running – it’s so easy to feel confident in those first miles. The sun came out between miles 5 and 6, right around when the course turns right onto Endville Road. It was the first time in a race that I was thankful for a significant headwind. 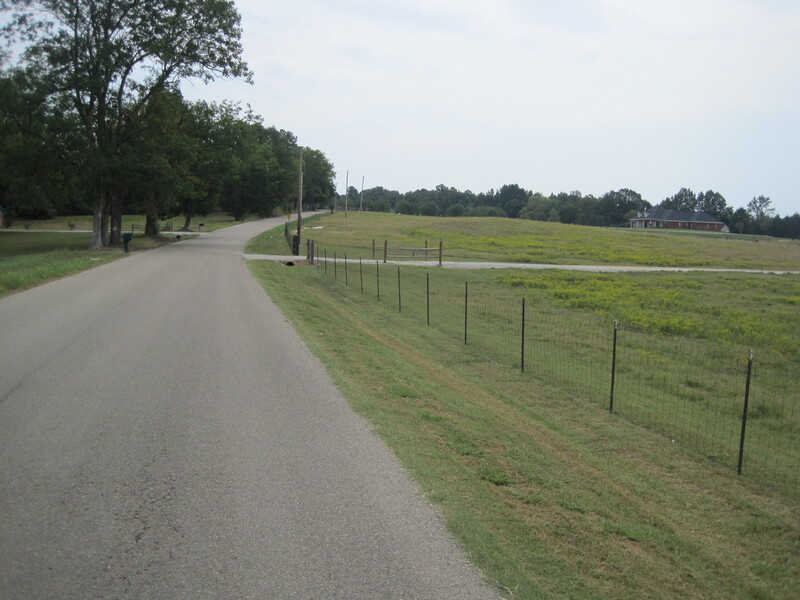 While the first few miles were windy, Endville felt like a series of straightaways with a dependable pattern of rolling hills. Around mile 9.5 the course veers south onto Countrywood Road, another 2-mile straight shot before turning east onto Butler Road, where we would have less than a mile to run through a very attractive subdivision to reach the 13-mile turnaround. At this point the weather had changed, actually dipping to 74 degrees, but making up for it in higher humidity (80%). It was beginning to rain lightly, which was refreshing, so I decided to increase my speed on the way back. And that lasted for about five miles. With humidity holding in the mid-80’s, I couldn’t keep pace. 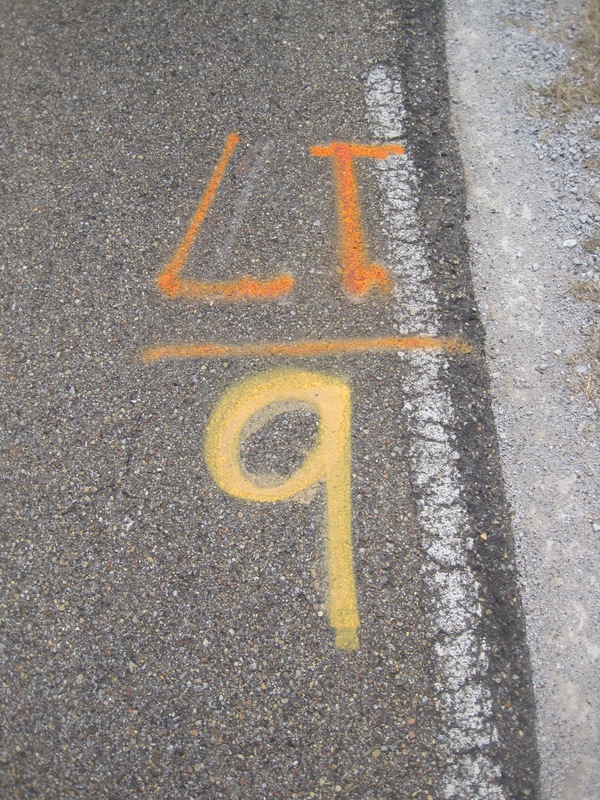 By mile 18, I had slowed down to a 10-minute pace and even that felt like a chore. The rolling hills on Endville felt so much easier in the first half, but this time they were forcing me to walk. By the time I got back onto Chesterville Road, I was picking landmarks and running to them before stopping to walk. My water bottle was a semi-nauseating mix of different flavors of watered-down Gatorade but without it I would have gone even slower. At mile 20 I stopped to tie one of my shoes whose laces had gotten loose. When I stood back up to run, it felt like someone was kicking me in the back of the knee every time I took a step. To seal the deal, the rain had kept steady until mile 22, where it became a true downpour. It didn’t last long, but it definitely slowed me down even more. 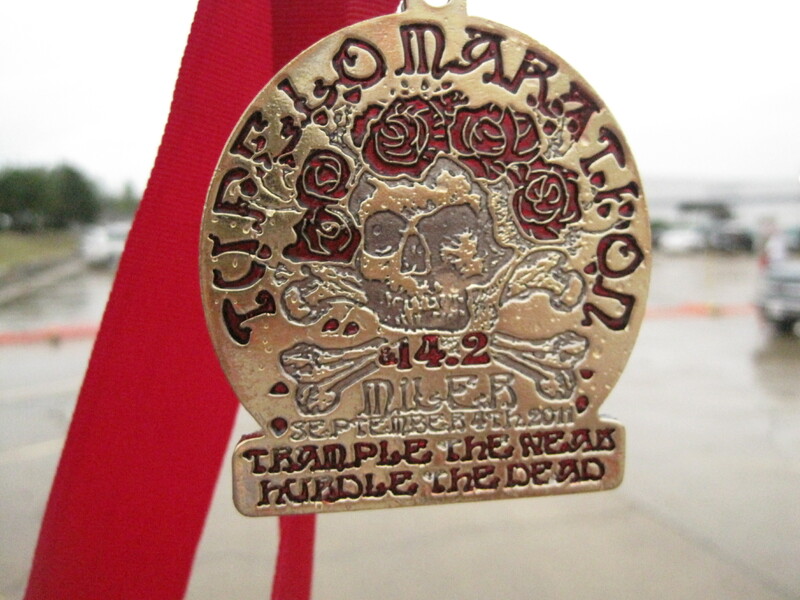 Every year the organizers give runners an impressively detailed skull and crossbones medal (check out 2006, 2008, 2009 and 2010) and this year was no different. I had finished a difficult race in challenging conditions and didn’t have a single injury or cramp to ruin my afternoon – I deserved a badass medal to immortalize the accomplishment. However, not all was well as my hotel didn’t give me a late check-out so I had exactly 20 minutes to lie down before having to leave. Note to self: running marathons is infinitely worse when you don’t have a bed readily accessible afterward (and ironically, I can go to sleep on command sitting in a moving car, but find it impossible to nap reclined in the driver’s seat). So the rest of the day was spent driving back to Memphis and eating. 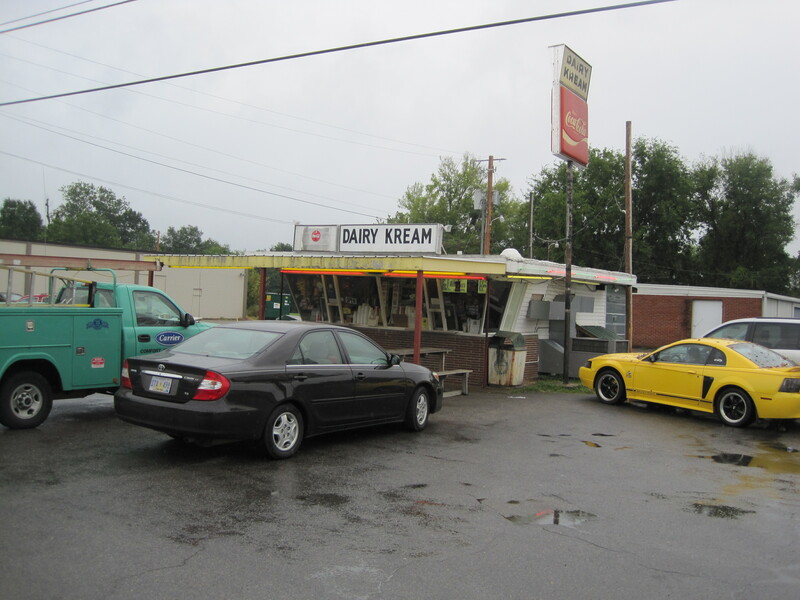 The day before, I had asked the charming lady at the front desk if she had a “good eats” recommendation and she sent me to the fine establishment of Dairy Kream. I was still pretty nauseated from eating only GU gels and washing them down with multi-flavored Gatorade, so I was in no mood for real food. So I had some ice cream instead. 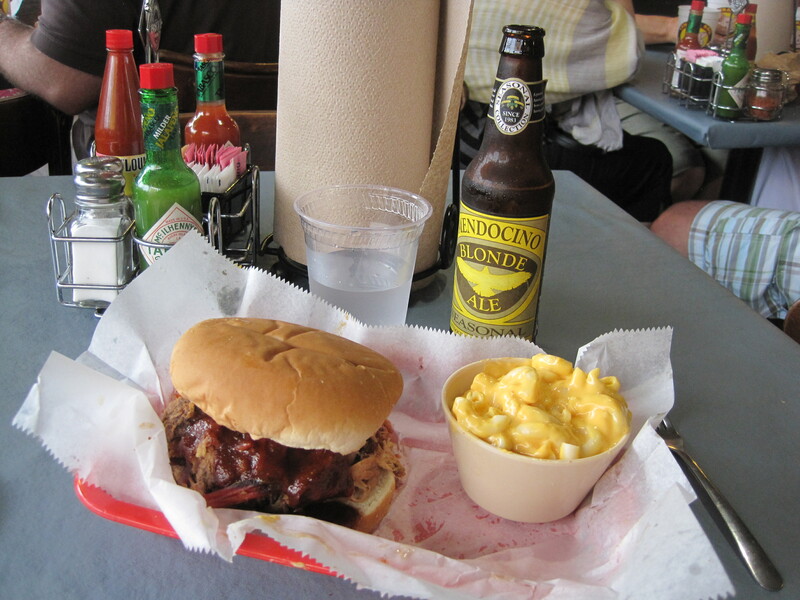 Two hours later though, I was ravenous and on the recommendation of a fellow runner whom I’ve never met in person, I went to Central BBQ and filled my stomach with delicious, juicy southern barbecue. So now I’m sixteen states down with the Southeast having provided both entertaining and memorable races. 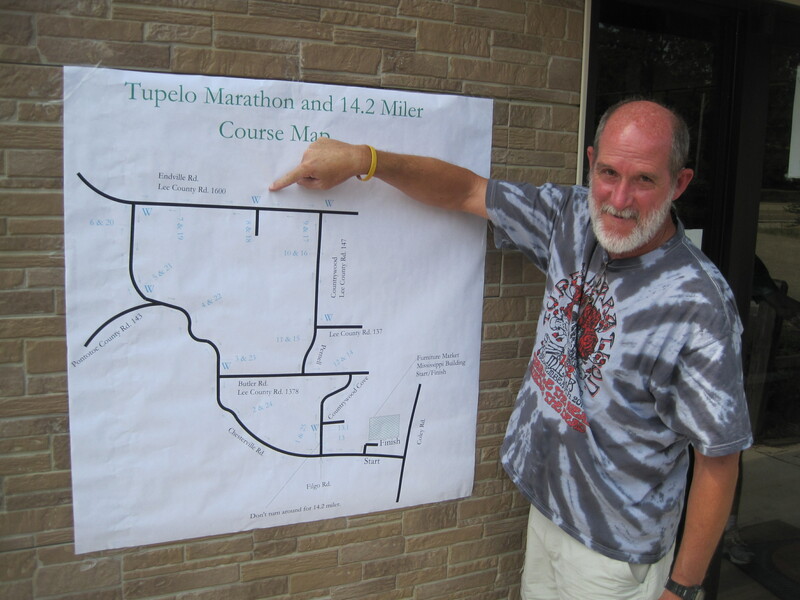 Tupelo felt like less of a large, overbloated event and more like a runner’s race. The hospitality was great and you really felt like the organizers wanted you to genuinely enjoy yourself; you weren’t just one registration fee closer to breaking last year’s attendance record. When you sign up, you get a personal email from Whiteside, welcoming you to the race. To be honest, I could get used to these small races (and I might have to, given that I’m boycotting competitor.com’s Rock ‘n Roll Race Series). But I’ll have to start that pattern next year, as I have two gigantic marathons planned during the next nine weeks: Chicago and New York City. Onwards! increible la medalla so worth the race!!! Dan – thanks for the comment on my Madison race. I’d just like to suggest that if and when you run Iowa, you chose the Des Moines Marathon in October. I had a great experience running the half last year and will run it again this year. The race is well run, great course, crowd support was amazing, and the finish area had a ton of good stuff. 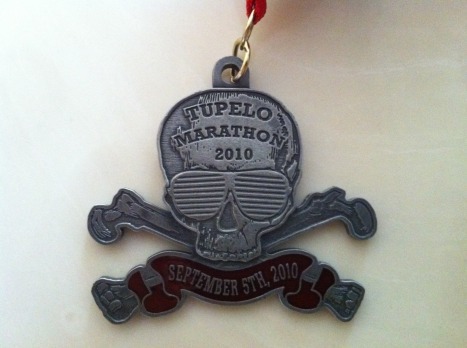 I’ve had this Tupelo race marked as one I’d like to look into…although it’d be the 14.2 mile version. Great medal! Thanks for the recommendation. 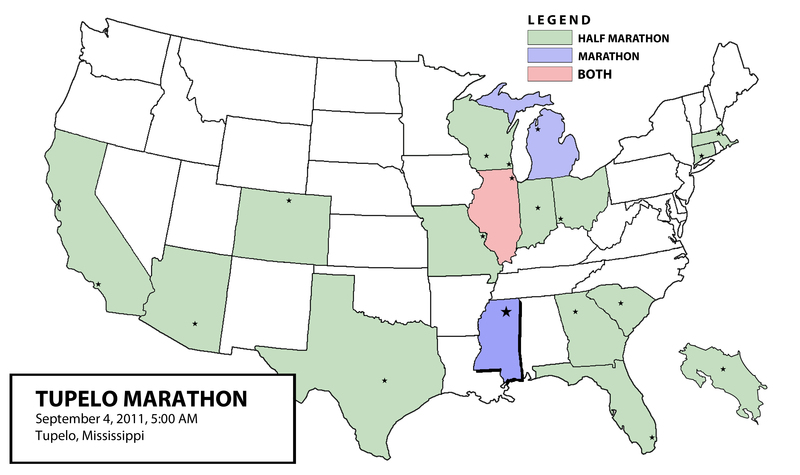 I was originally looking at the Quad Cities marathon, but that one isn’t 100% in either state. Now that you’ve endorsed Des Moines, I guess I have no choice! However, I won’t be tackling Iowa this year — my schedule won’t allow it. Perhaps in 2012 I’ll make the 5-hour drive out there from Chicago. Time will tell. Thanks for reading! “Third sweatiest person I know…” Lol. “Swan” looks like an elegant animal when it’s written, though! I just got this. Am I stupid? And for sure that accomplishment does deserve a badass medal! Well done! I don’t know if I have the intestinal fortitude to try a full marathon yet. Still seems like a very intimidating distance.